This unique Birmingham brand was duplicated throughout the town as two houses, or in this case two back-to-backs, either side of a tunnel ‘entry’. Access to the houses was along the entry and then a courtyard with other houses, privvy and brew. 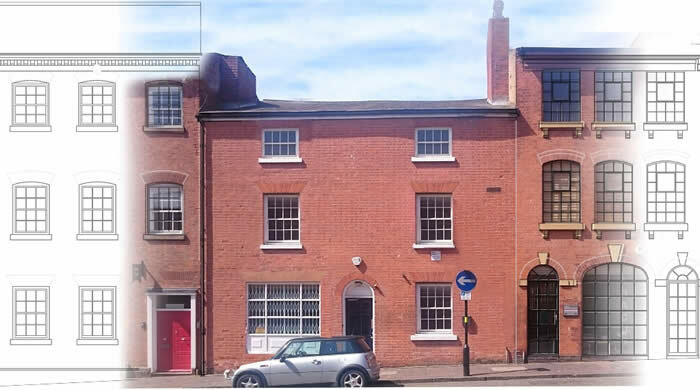 The houses were for large families doing piecework for the manufacturers in the Jewellery Quarter with vaulted basements and a large open top floor much like a ‘top-shop’. It is one of only a handful left in the city and by far the best example but, remarkably, it is not listed. It has been purchased by a well know local business man and PCPT have secured planning permission to recreate the form of the houses and the courtyard.